At 1:30am on Wednesday, May 28th I rolled out of bed, geared up in my LDComfort base layers, armored riding jacket and pants, and reflective yellow vest, rolled the bike out the door, and was back eastbound on Interstate 80 by 1:30am. Due to a somewhat embarrassing assembly mistake on my part, the previous day’s ride had ended early, and even worse, 200 miles short of the group rendezvous point. With this adventure easily sorted, my confidence in the bike itself had only increased. It was a lovely sensation to be showered, rested, and speeding along on a flawlessly operating motorcycle in the chill morning air. My LED headlight had no trouble illuminating the road ahead of me and I reveled in the solitude of an open road without the busy traffic I had grown accustomed to. With my optimism back, I settled into the ride and began to consider how far a thought I could make it that day. Would it be possible to ride all the way to the group rendezvous point in Council Bluffs, Iowa, making up the distance I had lost? Adding the 200 miles I had lost the previous day to the 550 miles allocated for this stage of the trip would put my total for the day at a formidable 758 miles. Averaging 60 mph I knew I was looking at a bare minimum of 13 hours of moving time in the saddle, not counting the 8-10 fuel stops that my Halcyon would require. After running over the numbers in my head, I decided to play it as it lay and enjoy the ride. A nice loop on Route 30 through Medicine Bow. Looking back West from the Great Continental Divide. Gassing up at Hostler’s General Store in Rock River, Wyoming. After filling up the tank I set off along the two lane Route 30 towards Medicine Bow. To the south I had a constant view of Elk Mountain in the distance. This would be my only real glimpse of the snow-clad Rocky Mountains, since George Wyman’s route followed the rail line and took him through the Wyoming Basin which passes between the Middle and Southern Rockies. I passed straight through the tiny town of Medicine Bow and past the winding Medicine Bow River before angling south towards Wilcox and Rock River. At Rock River I stopped for fuel at Hostler’s General Store, a picturesque place with old fuel pumps and a wood stove inside. The owner was quite deaf and it took some time to attract his attention away from what looked like his full time occupation of staring out the window. After fueling up and resetting my trip meter, I continued south toward Laramie where I had planned to have spent the previous night. I decided to fuel up again in Laramie and grab some breakfast before rejoining the interstate and heading over the Laramie Mountains. This was a very steep grade, and slowed me down to the pace of the semi-trucks, but it was nothing compared to the what Wyman had to endure on his rocky ascent. Interestingly, Wyman crossed this range a day behind President Roosevelt who was passing through that part of the country giving speeches in almost every town. At the top of this pass I reached the highest elevation of my journey at 8,640 feet above sea level near Buford, Wyoming. I should mention here that my carbureted Halcyon had almost no noticeable change in performance from the streets of San Francisco to the passes of the Wyoming Rockies. According to our jetting calculations for the EPA, the only necessary jetting change at extreme elevations (9,000 plus feet), would be to reduce the pilot jet by one size. On my way down towards Cheyenne, the slightly greener plains that I had passed through in the morning became richer green fields with small evergreen trees on the slopes around me. I decided not to stop in Cheyenne, but continued on for another 30 miles before refueling in Burns around 20 miles from the Nebraska border. Over a quick bite of lunch on a slightly longer stop I took some time to consider my goals for the day. I had covered roughly 280 miles since the early morning which left me with almost 500 miles to our rendezvous in Council Bluffs, Iowa. With the added comfort of the AirHawk seat I had been donated the day before I was feeling pretty good on the bike. Once again, I decided to just keep pushing and see where I ended up. Route 30 parallels I80 almost the entire way across Nebraska to Omaha and Council Bluffs, Iowa. 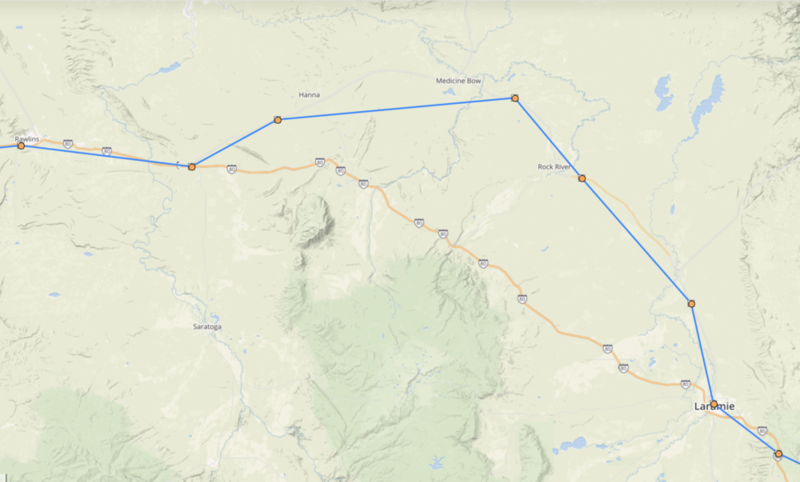 As much as I would have preferred to follow the Lincoln Highway along Route 30 instead of I80, I decided that I would give myself every advantage I could and stick to the slightly higher average speed of the interstate. This section of the ride was pleasant if uneventful. The rolling hills and mountains of Wyoming are gradually pressed out into the starched agricultural fields of the Midwest, so flat the you can almost see the curve of the globe at the horizon. With a gentle tailwind, the only change in elevation the ever so slight descent towards Omaha, I was making good time, stretching out my fuel stops and keeping a strict ten-minute schedule from the roll off of the throttle to when I rolled back on and merged back into traffic. I stopped for fuel at Sidney and then Ogallala, Nebraska, making good time through Barton where the road joins the South Platte River. At North Platte the South and North branches join to form the Platte River which winds across the state to join the Missouri River just south of Omaha and its sister city Council Bluffs, Iowa. Just after North Platte I stopped for fuel in the town of Brady. I hadn’t chosen the fuel stop well which meant I had to ride about a mile off the interstate to find the station. Brady is a sleepy little town along Route 30 and the train line. 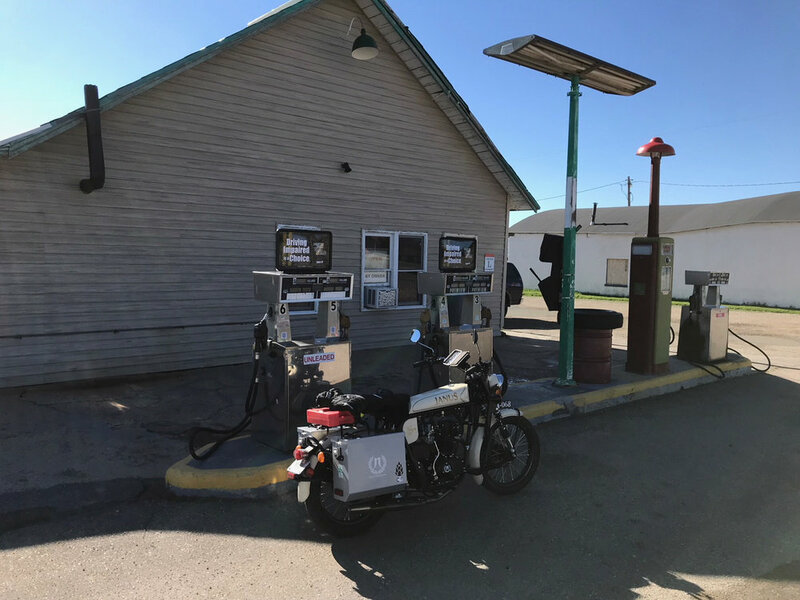 After filling up at the old pumps with their spinning and clicking mechanical readouts, I paid up inside and decided to continue along Route 30 instead of riding back to the interstate. By this time it was late afternoon and I continued on in the perfect late spring light as the sun began to cast longer shadows from the grain towers and silos I passed in almost every town. I continued on like this passing through similar little towns like Gothenburg, Cozad, Lexington, and Kearney, all the way to Wood River about 15 miles short of Grand Island. Half of me had been almost sure I would stop at Grand Island and spend the night, trying to make up the extra mileage on the next day’s shorter ride, but I was feeling pretty good, my Halcyon was purring along, and the idea of catching up with the rest of the group really appealed to me. It was just after 8:00pm and if I wanted to make it the 160 miles to Council Bluffs I needed to decide if I wanted to follow Route 30 along the Platte up and around through Columbus and Fremont, or follow the interstate straight across the plains through Lincoln to Omaha and Council Bluffs. As the sun started setting I decided on the interstate and veered off Route 30 at Alda, zig zagging my way down through the 1-mile squares of the continental grid. Gone were the winding roads of the West. This was feeling more and more like Indiana! At Mormon Island I rejoined I80 and settled back into the pace of interstate traffic. Straight as an arrow, the interstate sped on through the dark, mile after mile of flashing white lines with the occasional speeding car flying past on my left. By this point I was starting to feel the effects of almost 20 hours in the saddle. To alleviate some of this I would shift myself all the way over to one side of the seat for minutes on end and then shift all the way to the other side. This, along with propping my feet up on the folding pegs I had installed on the highway bars helped to stretch out my cramped muscles and keep some circulation moving in my legs and rear end. If you ever see a geared up motorcyclist doing weird things like waving their legs around or sitting half off the seat of their motorcycle, now you know why. Spotwalla track of the day’s 758-mile ride across Wyoming, Nebraska, and into Iowa. The final leg from near Grand Island to Council Bluffs took three and a half hours and was more an exercise in determination than a memorable ride. However, speeding into Omaha and riding across the Missouri River was a great end to the ride and it was with a very special feeling of accomplishment that I turned into the parking lot of the Red Roof Inn and saw several touring BMW’s with familiar looking covers. I had made it! 758 miles from 1:30am to 11:40pm, through Wyoming, Nebraska, and into my third state of the day, Iowa. I had also crossed the halfway point of my journey and was now closer to New York City than to San Francisco.